In Norwegian, an umbrella is called paraply. It takes its name from the French (presumably) parapluie. It means defence against the rain. A parasol is designed to use as defence against the sun. 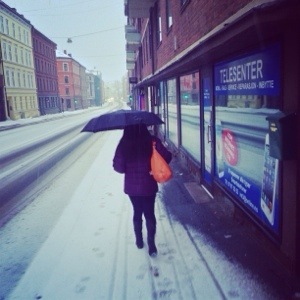 This lady in front of me today was using her umbrella to protect herself against the snow. I wonder if there is a phrase for that. Or if (since) snow is cold rain it therefore uses the same phrase?